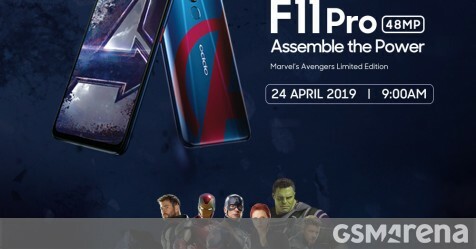 Oppo’s F11 Pro officially launched at the beginning of last month but a new version is coming in time for the latest Avengers movie, complete with a superhero makeover. The company has partnered with Marvel to bring the new device to Malaysia on April 24 right in time for the premiere of the latest superhero blockbuster. The phone will feature a distinct light blue back with the Avengers logo. We can also expect special packaging and accessories to tie in with the superhero look. Apart from the altered looks, the rest of the phone will be identical to the regular F11 Pro. The FHD+ screen comes in at 6.5 inches with minimal bezels thanks to the motorized 16MP selfie cam. The back features the dual 48MP + 5MP camera setup and a capacitive fingerprint scanner. The phone runs on the Helio P70 SoC paired with 6GB RAM and 128GB storage. The battery capacity is 4,000 mAh and supports 20W VOOC Charge 3.0 via microUSB. Pricing is still unannounced but buyers should expect to pay some premium as this is a limited edition device.